It was such a Freight Train of a Story I just couldn't stop Reading. 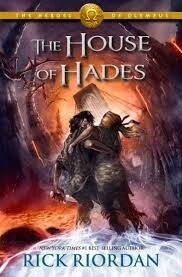 The main characters in this story are Percy, Annabeth, Jason, Leo, Piper, Hazel, Frank, Nico, and Coach Hedge. The exciting adventure takes place in Southern Europe, the Mediterranean Sea, and the Argo II, which is a flying ship. The main characters save their friends Percy and Annabeth from Tartarus while also trying to stop Gaea from rising and taking over the world. The conflict is when they keep getting attacked when they try to save their friends. The point of view is from all of the main characters (it switches around every few chapters). So... What is this Book About? This novel is about when the main characters save their friends, Percy and Annabeth, from the poisonous, deep abyss of Tartarus. Also, they try to stop the god of Earth, Gaea, from taking over. My life has a lot in common with this book. First, when Gaea was rising and taking over the world, I felt like i started taking over my life a little bit more at a time. Next, when Percy and Annabeth fall into Tartarus and then later take the Doors of Death out of Tartarus it feels like when they fell in, i just started sixth grade because everything was new and revolting to me and i didn't know anything about this strange place. But when they came out, it felt like my life in sixth grade started to improve or raise.